Newhaven and Seaford. Alex was the son of Peter Rankin, and, after leaving school, followed his father into postcard publishing. 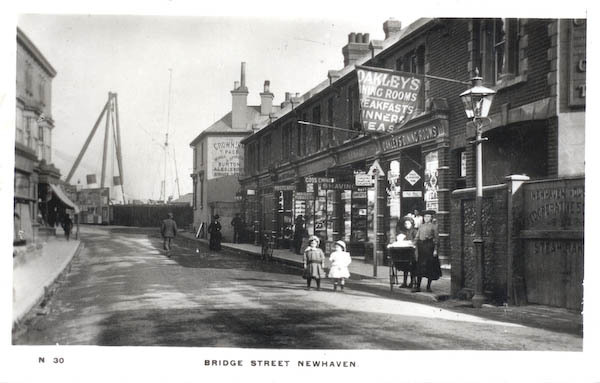 His "Real Photo Series" of real photographic cards of Newhaven and Piddinghoe are of high quality. The photographs are black and white with a suggestion of sepia and have crisp white borders. The captions are printed in the centre of the lower border of each card and are often prefixed by the letter "N" and a serial number, e.g. "N 22 South Road, Newhaven". Card N 30 of Bridge Street shows Oakley's Dining Rooms and adjoining shops with the Crown Inn in the distance. The photographs are believed to date from around 1912. The Rapid Photo Co. of London printed cards of rather similar appearance for retailers in many parts of Britain, and may have supplied Rankin with his Real Photo Series.